Habitat: Common in the mountains near Chihuahua. 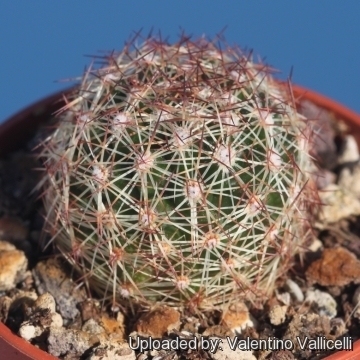 Description: Usually simple or caespitose and very spiny, usually hidden by the spines. Stems: Spherical to short cylindric up to 20 cm tall and 7 cm in diameter, very variable ill size and shape. Tubercles: Short grooved on their adaxial (upper) sides in sexually mature plants. Radial spines: Numerous, dull white, spreading, mostly somewhat adpressed on the stem. Flowers: Small, produced laterally (like in mammillarias) and not apically, 1-2 cm long and up to 2 cm in diameter, pale pink to purplish. Outer perianth-segments broad, often rounded at apex with ciliate margins; inner perianth-segments pointed. Stigma-lobes, 5-6 white. Fruit: Up to 10 mm long and 7 mm broad, green, oblong. 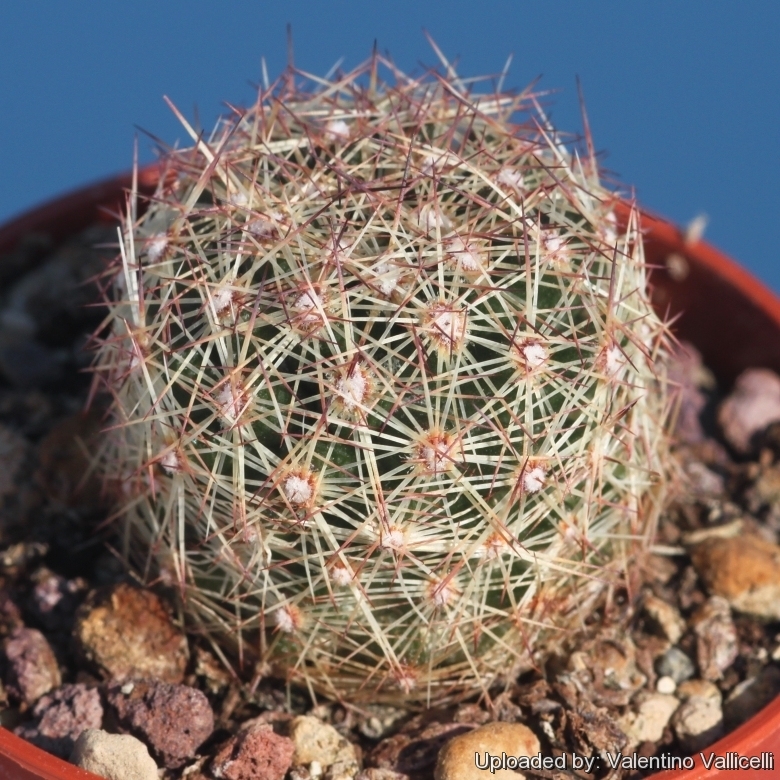 Cultivation and Propagation: Escobaria chihuahuensis is an easy to grow succulent, more cold tolerant than most and less fussy regarding soil conditions. Hardiness: Reputedly somewhat resistant to frost if kept on the dry side prior to, and during, cold weather (hardy to -12C ° C for short periods). Exposition: Outside bright but sunlight or afternoon shade, inside it needs bright light, and some direct sun. Tends to bronze in strong light, which encourages flowering and heavy spine production. Propagation: Division, direct sow after last frost. Seeds germinate in 7-14 days at 21-27° C in spring, remove gradually the glass cover as soon the plants will be well rooted (ca 3 days) and keep ventilated, no full sun for young plants! To make a cutting twist off a branch and permit it to dry out a couple of weeks, lay it on the soil and insert the stem end partially into the soil. Try to keep the cutting somewhat upright so that the roots are able to grow downward.